We love collaborating with other tiny house companies in Australia. And we love knowing that other tiny houses are being built on the best made tiny house trailers available… ours! That’s why we joined with Janine Stachan from Tiny House Solutions when she proposed a collaborative partnership for her Tiny House kit homes made from structurally insulated panels. Fred designed a trailer to accept the SIPs as well as a connecting deck with stairs to the front door of the tiny house. Now Janine’s customers can buy a tiny house kit and construct it on a Fred’s Tiny House Trailer made to exact specifications. Don’t build a tiny house on wheels as though it’s a building. It’s not a building, it’s a road vehicle first, so it needs to be built to a higher standard than the Building Code of Australia (BCA) National Construction Code (NCC) for traditional houses. 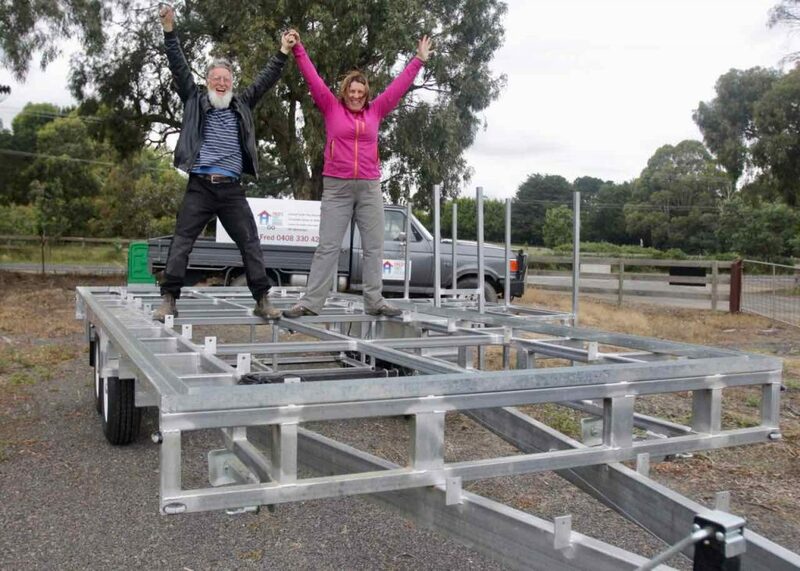 It needs to withstand vibrations and wind forces that could rattle a conventionally-built house off a trailer, right into the car travelling behind it. Don’t have your company name on a tiny house that falls off the trailer or breaks down during transport. Ensure you are using the strongest, safest, lightest-weight tiny house building method available. Fred’s patent pending Unified Construction Method™ has been developed from years of research and VASS engineer consultations, collaborating with building experts and material manufacturers to make sure that your tiny house vehicle can withstand the forces placed upon it during travel. The Unified Construction Method™ isn’t about strength alone, it also includes both a highly effective and proven roof insulation for summer radiant heat protection as well as a sensible floor insulation for winter, keeping your client’s toes warm. All these benefits of the Unified Construction Method™: strong, lightweight & well insulated help you as a tiny house builder market and sell more tiny houses. If you are a commercial tiny house builder or looking to become one, save yourself the trial and error by getting the answers quickly easily and in accurate detail by purchasing a Fred’s Tiny House Trailer with a single use license for the Unified Construction Method™ and all the support from Fred. Give your customers peace of mind knowing that their tiny house on wheels is built for the road as well as for comfort. It can withstand the forces placed upon it of vibration and upward lifting forces while being towed along a freeway. We have figured out how to build comfortable tiny houses that are also safe vehicles so you don’t have to. And we want all tiny houses on wheels to be safe, so we make our licenses affordable. Call us on (03) 5472 2130 to get more information.